Some of you have watched with interest the DVD of ‘Carnival of Souls’ 1962 after my recent blog, and emailed to say that you enjoyed it, but wondered if I knew anything about the creepy derelict Pavilion used in the movie. 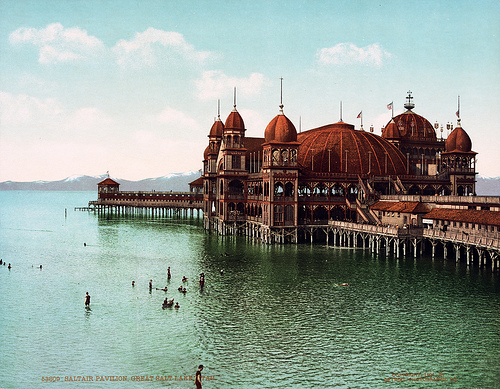 The Pavilion was built in the 1800′s as a health spa on the edge of The Great Salt Lake in Utah. Thousands came to take to the waters that were heavily salted… the only creatures able to sustain life in it’s saline depths were tens of millions of Brine Shrimps, harvested today as pet fish food… In those days one could simply float without drowning in the water! The end of the Pavilion came as part of The Great Salt Lake began to dry, and by the time the movie ‘Carnival of Souls’ was made in 1962 The Saltair Pavilion was in a sorry state. I hope that makes the film even more interesting for you… By the way, the director had seen the Moorish type Pavilion driving home one night across state, and seeing it at its most erie gave him the idea for the film. This entry was posted in Patrick's Words and tagged The Saltair Pavilion. Bookmark the permalink.